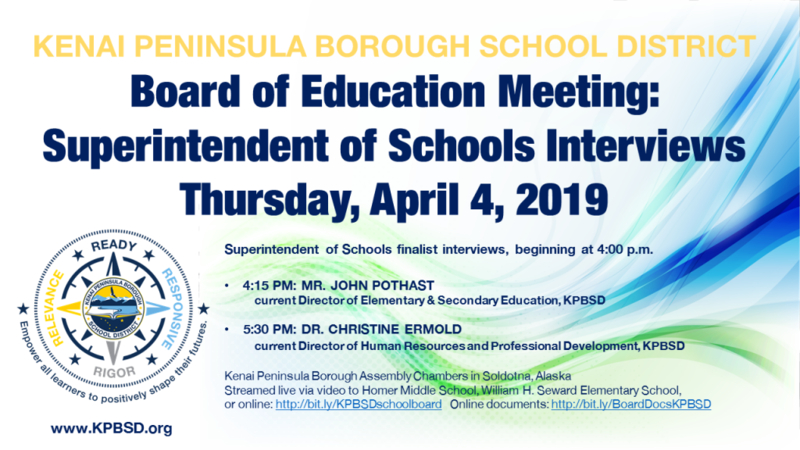 Soldotna, April 1, 2019—The Kenai Peninsula Borough School District Board of Education is pleased to announce that on Thursday, April 4, 2019, the Board will conduct interviews for the new superintendent of schools. Interviews will be at the George A. Navarre Administration Building, Assembly Chambers, 144 North Binkley St., Soldotna, Alaska, beginning at 4:00 p.m. Audience members must sign in and sign out in order to submit input forms. Audience members must attend the candidate’s interview in order to offer feedback. Input forms must be submitted before leaving the room in order for the board to consider them during the process. The school board conducted a nationwide search and contracted with the Association of Alaska School Boards to facilitate the search process. Initially, three candidates were invited to interview as finalists, but Dr. Ken Haptonstall withdrew his application on March 31, 2019. The school board intends to make the announcement of their choice of a new superintendent as soon as possible following the final interviews and deliberations on the afternoon and evening of Thursday, April 4, 2019. This entry was posted on April 1, 2019 at 11:59 am. You can follow any responses to this entry through the RSS 2.0 feed. You can leave a response, or trackback from your own site.